Extreame Savings Item! 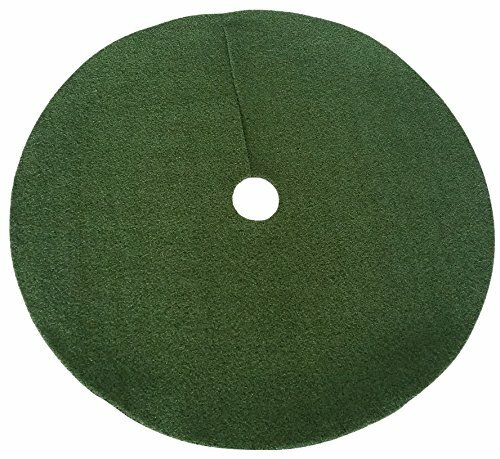 Save 50% on the Zen Garden Artificial Grass Christmas Tree Skirt w/ Anti-Slip Rubber Base (48'' Diameter) | Realistic Synthetic Round Grass Rug | Indoor & Outdoor Xmas Tree Skirts | Unique Holiday Decorations (Green) by Zen Garden at Two Clock. MPN: 612409798794. Hurry! Limited time offer. Offer valid only while supplies last. Attract the Compliments with Artificial Grass Tree Skirts Do your Christmas tree some beautiful justice with Zen Garden’s fake grass tree skirts. Do your Christmas tree some beautiful justice with Zen Garden’s fake grass tree skirts. Carefully designed for a realistic look, made using premium materials for lushness you’ll love, and crafted to be truly weather-resistant, this faux grass tree rug complements any Xmas décor with a touch of unique aesthetics. - Extra-lush design feels impressively soft. - 100% free of lead and other toxins. - UV and water-resistant durability. - Rubber backing for extra-stability. Take the unique route this holiday season with a Xmas tree skirt that truly stands out. Borrowing a leaf from our popular synthetic grass patches, these tree skirts accentuate any space with a realistic feel and natural-looking charm. Get the holiday spirit in full effect with our choice of festive colors that transform your tree into a compliment magnet. Beef up your Christmas decorations kit with a tree skirt that lasts. No more worrying about material fraying, seams coming apart, or stitching get loose. Zen Garden faux grass tree skirts beautifully handle the rigors of the busiest holiday households and are also fully weather-resistant. So, you can use them outdoors, no problem. One slide of a holiday tree skirt can bring your entire tree and all its ornaments tumbling down. That’s why we’ve thoughtfully fitted our tree skirt with rubber backing that keeps it securely in place all through the activity and prevents it from bunching up. So now you won’t have to worry about a mess on that Christmas morning gift rush. Whether you intend to make a grand statement with a massive Xmas tree or intend to keep things a bit simpler, you’ll find the right synthetic grass rug to match your tree from our collection. We also take great pride in creating artificial grass tree skirts that are completely toxin-free. Create memorable décor knowing that your family is nice and safe. We set out to create premium synthetic grass patches that blended aesthetics and functionality. Artificial grass that could weather the harshest sun or torrential rain. Fake grass that pets or kids would love spending time on. Synthetic grass that looked so real your neighbor would have to get on all fours to confirm it’s not. And that’s how Zen Garden was born. TOUCH OF UNIQUENESS: Make your holiday tree really pop with a unique merry Christmas tree skirt you won't find just anywhere. Unlike majority of Xmas tree skirts made using fabric, Zen Garden's are made using synthetic grass that looks just like the real deal. Soft, lush, and available in eye-catching color options, this fake grass holiday tree skirt enhances your Christmas décor with beautiful believability. DESIGNED TO LAST: No more having to replace Christmas tree skirts every other holiday. The blades of our fake grass x-mas tree skirt are crafted from high-quality polypropylene that's been thoroughly tested to be 100% toxin and lead-free. This gives the round artificial grass mat an extra touch of durability, makes it safe for use around kids & pets, and a breeze to clean. THOUGHTFUL DESIGN: We've fitted this synthetic grass under tree skirt with a rubber base for impressive grip. So it stays in place even as the kids and pets play around. Zen Garden cute Christmas tree skirts are available with a 48" diameter (6" hole), or 36" diameter (3.5" hole) to fit just about any Christmas tree. GREAT FOR OUTDOORS: This isn't just an indoor tree skirt. Thanks to the weather-resistant design, you can use it to accentuate your landscaping and spruce up your yard with lovely color. Our indoor/ outdoor Christmas tree skirt is UV-resistant, doesn't degrade in the event of snow or rain, and doesn't absorb any odor in case your pet pees on it. 100% SATISFACTION GUARANTEE: We love it when our customers are thrilled. That's why we've backed these realistic artificial grass tree skirts with our total satisfaction guarantee. If you have any questions or issues, simply reach out to us and we'll do all we can to make you smile. Click 'Add to Cart' now and decorate your holiday tree in unique style! If you have any questions about this product by Zen Garden, contact us by completing and submitting the form below. If you are looking for a specif part number, please include it with your message.